In light of International Womens Day i have been asked to describe how I landed a career the construction industry. ‘My route into the industry happened very much by accident. I had left school as soon as I could after O levels but as I struggled to secure any ‘decent’ employment I accepted that my parents were correct! I’d made a huge mistake; and so reluctantly made the decision to go back to college. I had decided I was going to enrol on a BTec OND in Business Studies course at Barnsley College. The parents approved! However; when I arrived the queue for Business Studies registration was long, very long; as an impatient teen with attitude, I looked around and noticed the Construction desk had no queue! So I wandered over, had a chat with the tutors about the course content, about how there was a need for more females in the industry. It all sounded really interesting, offering prospects for both graduates and vocational trainees. As a slightly rebellious teen, I made the decision to sign up for the male dominated 2 year full time OND in Construction. This was back in 1987. There were only two girls on the course with me – out of a total 30 students. We were accepted by the tutors and the other lads on the course and as a group we all bonded into friends quickly. After about six weeks I realised that it was the best possible choice I could have made; I was interested, I was getting great results for assignments, so I got my head down, really applied myself and finished the really enjoyable two year course with distinctions and merits feeling really inspired and motivated to enter the Construction Industry. Financially full time University wasn’t an option for me so I started job hunting …..again!!!!! but this time with a much healthier CV and portfolio. I secured my first position as a trainee mechanical design engineer within a Local Authority who offered a day release vocational training route that took me through a HNC Building Services (HVAC) day release programme and then a further HNC in Construction. Again, I was in a male dominated arena, with only one other girl in the electrical team. During my HNC’s I had only one other female colleague who was also a design engineer. Going through the vocational route was, for me, the best option – I was never an academic; It quickly installed a work ethic, experience of how a project evolves in reality, an ability to work in different environments, with different people and disciplines and on a variety of different projects. Over the last 26 years I have worked in design, M&E, building surveying, contracts management, project management, energy efficiency, renewables, business development and business strategy. Personally I have never distinguished between male and female colleagues – as long as you’re professional, respectful, hardworking, and committed to your role, gender doesn’t matter. Diversity in the workplace is incredibly important – whether it’s gender, age or cultural diversity – we need a mixture of people to develop creative and dynamic workplaces. Women bring a varied skillset to the table and it’s such a shame that more young girls aren’t taught about the opportunities available to them. I have two teenage daughters and I am disappointed to say that throughout all their career advice to date the only suggestion of the Construction Industry as a career has come from me. 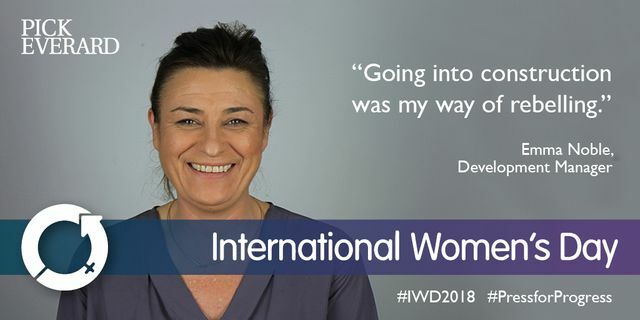 International Women’s Day is a great opportunity to spread the word that women really can do anything – the construction industry is massive and there’s space for women to wear high vis jackets as well as heels (not on site though!) if they want; from the trades through to architecture and MEP; there’s a role for everyone. I would recommend young people getting out there and talking to people in the industry, bully the Careers Officer for a career map suiting their skill, abilities and interests, getting in touch with local companies, the Chartered Institutes, colleges, universities and asking questions – do they offer work experience? Can you shadow someone in the team for a week? Do they offer apprenticeships? I’m so glad my impatient decision not to wait in a long queue led me down the right path; but I know other people aren’t quite as lucky; so I would advise all students, not just the girls to be proactive, find out what they like and what they don’t like the sound of, and not be afraid of being the odd one out or being treated differently. Resi is Still Booming ! !